When printed, this page will be automatically re-formatted. There are no separate "Printer Friendly" versions of pages on this site. To preview the printed format, use Print Preview in your browser. There are as many reasons to dislike windows 10 as there are grains of sand on the beach. Here is one that I just experienced. The computer in question was running Windows 10 Professional service pack 1703 (a.k.a. the Creators Update released in March 2017). This is the penultimate service pack, the most recent one is 1709. It had bug fixes as of January 3, 2018 (in other words, it was Build 15063.850). This too, is the penultimate clump of bug fixes; the latest patches, Build 15063.877, were released on January 17, 2018. The PC was configured to use the Current Branch for Business rather than the Current Branch that Windows 10 Home users (a.k.a. Guinea Pigs) are forced into. More to the point, it was configured not to install bug fixes quickly. Feature updates were postponed for 33 days. Quality updates were postponed for 10 days. 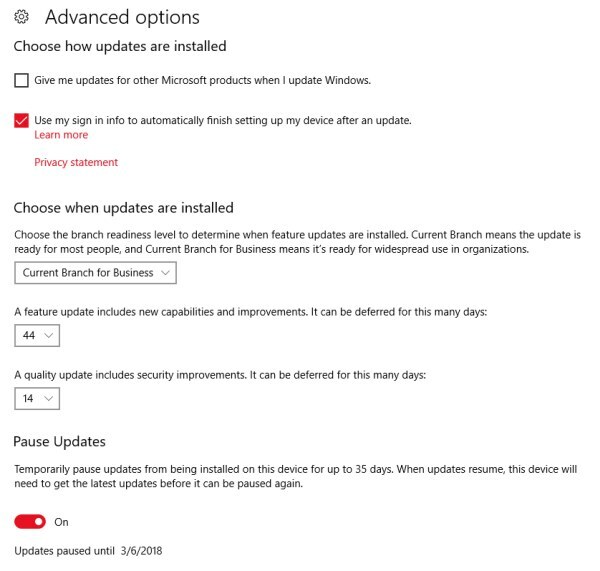 The specific settings, shown below, are available from Settings -> Update and security -> Advanced options. Last night, I closed the lid on the laptop and heard it beep to indicate that it was sleeping. Today, when I picked up the laptop, it was hot. This indicates that the CPU was running, probably all night. There is an older CPU in the machine and it gets fairly hot when called on to do a lot of calculating. I have, in the past, seen Windows go into a CPU loop after a patch is installed and prior to the mandated reboot. Had the machine not been in a well ventilated position, this could have caused a fire. Opening the lid did nothing, it was still sleeping (the power button blinks to indicate this). Press the power button again and again and again and again and nothing. With no other option, I press and hold the power button for about 8 seconds or so and the machine finally springs to life. But, it is restarting, rather than resuming. Work in flight is lost (hibernation is disabled). More than restarting, it is installing bug fixes as part of the boot process. WTF? The Windows Update history shows that it installed an update, KB4023057, yesterday. When yesterday? None of my business. King Microsoft only deems us peasants worthy of the date, the time of day is reserved for the Royals. The fix is dated January 25, 2018. Those deferrals for feature and quality updates appear to be a scam. I am increasing the number of delay days (above) and just now turned on the option to pause updates until March 6, 2018. Who knows if that option is also a scam. Forcing a reboot of my computer while both it and I are sleeping is a sin that can NEVER be forgiven. So too, is not following your own rules for installing bug fixes. Clearly, Microsoft thinks that it is their software rather than ours. Legally, this may be true, but dealing with their victims (a.k.a. customers) like this, just drives them away. UPDATE. Jan. 30, 2018: According to Woody Leonhard, KB4023057 is "an old - downright ancient - patch."